What's the point of Pauli's Exclusion Principle if time and space are continuous? What does the Pauli Exclusion Principle mean if time and space are continuous? If time and space are continuous then identical quantum states are impossible to begin with. in the question. This assertion is just plainly false. A quantum state is not given by a location in time and space. The often used kets $\lvert x\rangle$ that are "position eigenstates" are not actually admissible quantum states since they are not normalized - they do not belong to the Hilbert space of states. Essentially by assumption, the space of states is separable, i.e. spanned by a countably infinite orthonormal basis. Real particles are never completely localised in space (well except in the limit case of a completely undefined momentum), due to the uncertainty principle. Rather, they are necessarily in a superposition of a continuum of position and momentum eigenstates (a wave packet). Pauli's Exclusion Principle asserts that they cannot be in the same exact quantum state, but a direct consequence of this is that they tend to also not be in similar states. This amounts to an effective repulsive effect between particles. You can see this by remembering that to get a physical two-fermion wavefunction you have to antisymmetrize it. 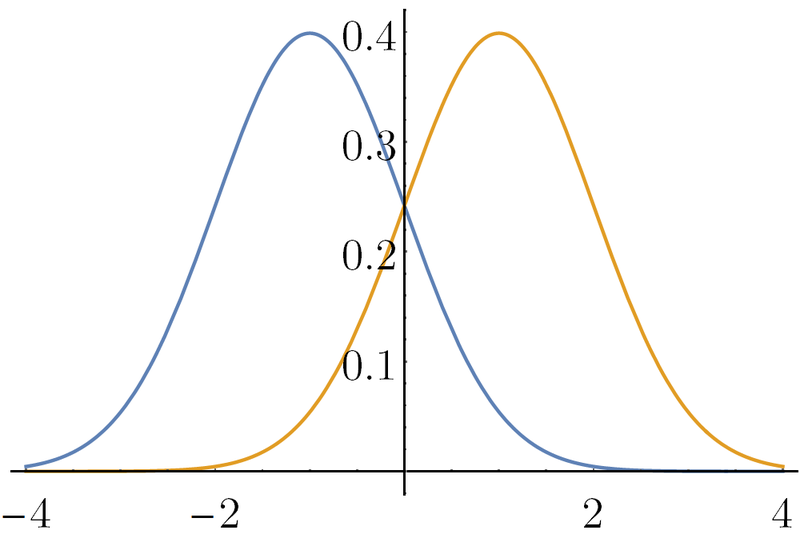 This means that if the two single wavefunctions are similar in a region, the total two-fermion wavefunction will have nearly zero probability amplitude in that region, thus resulting in an effective repulsive effect. As you can clearly see for this picture, for $x_1=x_2$ the probability vanishes, as an immediate consequence of Pauli's exclusion principle: you cannot find the two identical fermions in the same position state. But you also see that the more $x_1$ is close to $x_2$ the smaller is the probability, as it must be due to the wavefunction being continuous. Addendum: Can the effect of Pauli's exclusion principle be thought of as a force in the conventional $F=ma$ sense? The QM version of what is meant by force in the classical setting is an interaction mediated by some potential, like the electromagnetic interaction between electrons. This is in practice an additional term in the Hamiltonian of the system, which says that certain states (say, same charges very close together) correspond to high-energy states and are therefore harder to reach, and vice versa for low-energy states. 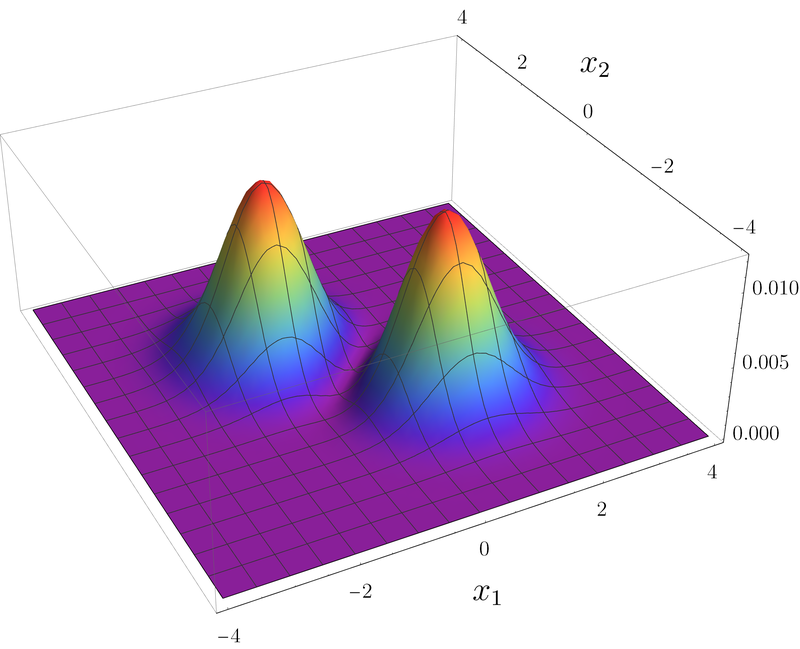 Pauli's exclusion principle is conceptually entirely different: it is not due to an increase of energy associated with identical fermions being close together, and there is no term in the Hamiltonian that mediates such "interaction" (important caveat here: this "exchange forces" can be approximated to a certain degree as "regular" forces). Rather, it comes from the inherently different statistics of many-fermion states: it is not that identical fermions cannot be in the same state/position because there is a repulsive force preventing it, but that there is no physical (many-body) state associated with them being in the same state/position. There simply isn't: it's not something compatible with the physical reality described by quantum mechanics. We naively think of such states because we are used to think classically and cannot really wrap our heads around what the concept of "identical particles" really means. Ok, but what about things like degeneracy pressure then? In some circumstances, like in dying stars, Pauli's exclusion principle really seems to behave like a force in the conventional sense, contrasting the gravitational force and preventing white dwarves from collapsing into a point. How do we reconcile the above described "statistical effect" with this? What I think is a good way of thinking about this is the following: you are trying to squish a lot of fermions into the same place. However, Pauli's principle dictates a vanishing probability of any pair of them occupying the same position. The only way to reconcile these two things is that the position distribution of any fermion (say, the $i$-th fermion) must be extremely localised at a point (call it $x_i$), different from all the other points occupied by the other fermions. It is important to note that I just cheated for the sake of clarity here: you cannot talk of any fermion as having an individual identity: any fermion will be very strictly confined in all the $x_i$ positions, provided that all the other fermions are not. The net effect of all this is that the properly antisymmetrized wavefunction of the whole system will be a superposition of lots of very sharp peaks in the high dimensional position space. And it is at this point that Heisenberg's uncertainty comes into play: very peaked distribution in position means very broad distribution in the momentum, which means very high energy, which means that the more you want to squish the fermions together, the more energy you need to provide (that is, classical speaking, the harder you have to "push" them together). To summarize: due to Pauli's principle the fermions try so hard to not occupy the same positions, that the resulting many-fermion wavefunction describing the joint probabities becomes very peaked, highly increasing the kinetic energy of the state, thus making such states "harder" to reach. Here (and links therein) is another question discussing this point. Not the answer you're looking for? Browse other questions tagged quantum-mechanics wavefunction pauli-exclusion-principle or ask your own question. Is Pauli-repulsion a “force” that is completely separate from the 4 fundamental forces? What is the formal definition of a system? How can Pauli's exclusion principle originate forces? Can two solid objects pass through each other if they are moving sufficiently fast relative to each other? Does Pauli Exclusion forbid two neutral fermions to occupy the same location in space?